This is one of my favorite dishes. 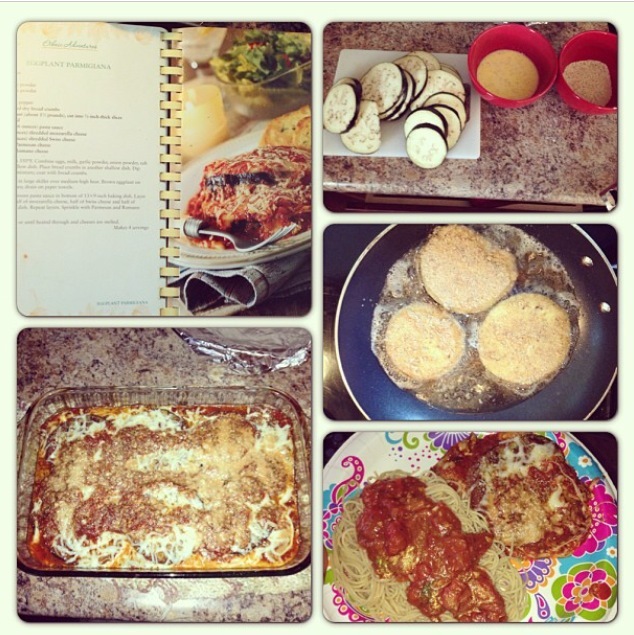 Eggplant is such a tasty addition to any pasta meal. 1. Preheat oven to 350 degrees. In one bowl, mix eggs, milk, seasonings. In another bowl, add your bread crumbs. Using a frying pan add your oil and set to medium heat. Slice your eggplant. Take each slice of eggplant and dip into the egg mix and then into the bread crumbs. Place each slice in your oil and let brown on each side. Drain eggplant on paper towel. 2. In your baking dish layer pasta sauce at the bottom and begin layering your eggplant slices that have been lightly breaded and fried. Add pasta sauce and cheeses and repeat layering two more times. Once you have finished you will add the rest of the sauce and cheeses to the top. 3. Bake for 30 minutes. Let cool and serve aside the pasta of your choice. Note: I use organic eggplant and whole grain thin spaghetti. Pasta sauce is your choice. I usually use Spicy Red Pepper by Classico or Prego’s Tomato, Basil, and Garlic. Spice up your sauce by adding fresh basil as well. Tonight’s Dinner fresh out the oven. 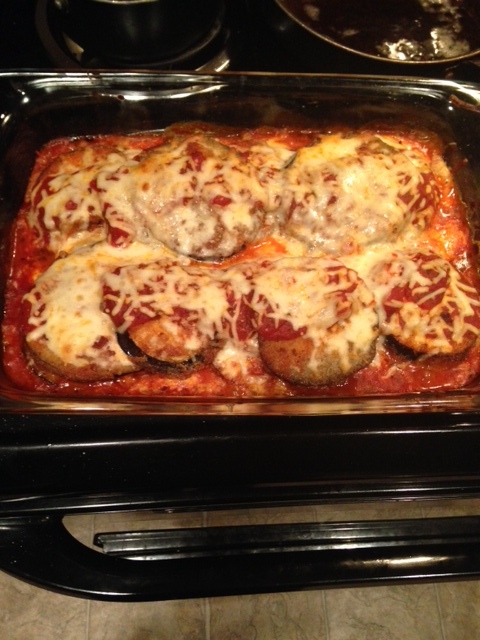 The iron, calcium and other minerals in eggplant supply the essential nutrients required by the body. All this, while relishing a highly flavorful veggie, is a good deal, indeed! Stuff, grill, bake, roast, stew your eggplants—they’re delicious in most avatars! Eggplants contain certain essential phyto nutrients which improve blood circulation and nourish the brain. But remember—these nutrients are concentrated in the skin of the eggplant, so don’t char and throw it away. They provide fiber, which protects the digestive tract. In fact, regular intake of eggplants can protect you from colon cancer. Eggplants have a role in heart care, too. Research studies show they can lower ‘bad’ cholesterol. But you must cook them the right way to get these benefits. Fried eggplant soaks up a lot of fat, making it harmful and heavy. Instead, bake it at 400 degrees, which brings out glorious flavor and gives you all the goodness an eggplant holds! Regular consumption of eggplant helps prevent blood clots—thanks again to Vitamin K and bioflavonoids, which strengthen capillaries.